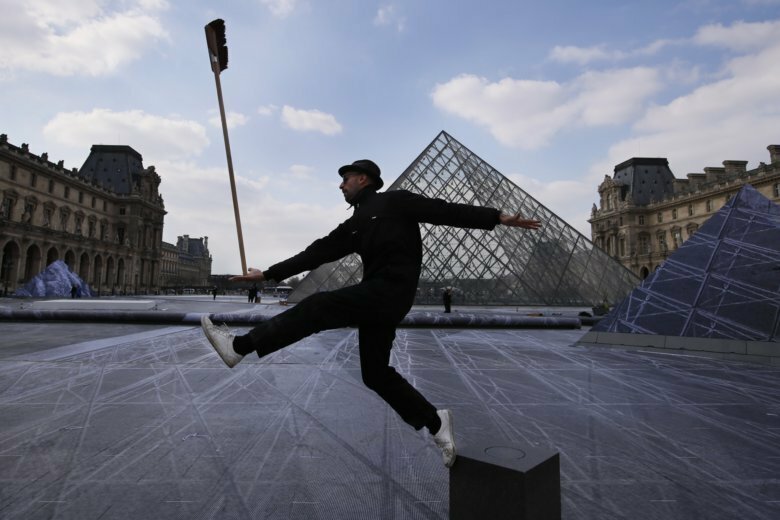 PARIS (AP) — In a feat of optical illusion, French street artist JR completed a collage Friday that plunges the Louvre’s pyramid into a vast chasm to mark the famed glass structure’s 30-year anniversary. The temporary ground collage made of paper strips, when viewed from above, gives the famed 21-meter-high (nearly 70-foot-high) structure dizzying added depth, and is the second time JR has worked his art around Paris’ most visited museum after making it “disappear” in 2016 with a black and white photo trick. It had Louvre President Jean-Luc Martinez enthused. “It magnifies this iconic monument… I was immediately seduced,” he said. But instead of transporting attendees at Friday’s opening to an imagined landscape, it seemed to leave many very unseduced amid complaints they couldn’t see any optical illusion from the ground at all. Some even accused the art of elitism, saying they were disappointed that the only way to appreciate the installation was to get a special VIP pass to view it from a balcony. The Louvre defended the choice by saying an aerial view of the work would be projected to the public by two plasma screens in the courtyard. Officials, including French Culture Minister Franck Riester, feted the anniversary in a conference inside the museum Friday evening. The Louvre’s pyramid, designed by Chinese-American architect I. M. Pei and inaugurated on March 29, 1989, has often been the target of complaints or controversy. The monument was initially likened to “sacrilege” as some thought the modernist edifice was at odds with the classic Renaissance style of Paris’ most prized palace. The Guangzhou-born architect was also accused of being insufficiently French by some in the media. But with the passage of time, the uncommonly-shaped lattice structure has won its detractors — and tourists — over. Chinese engineer Yuan Chen, 30, brushed off criticism that a China-born architect shouldn’t have designed Paris’ second most recognizable peak.